Jenny Jen42: Hooping Rain , Shine or Snow! Hooping Rain , Shine or Snow! Last Saturday, Feb. 13, we were all still pretty snowed in and a little stir crazy. 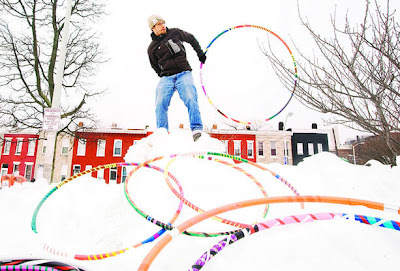 My man, Spilly, was out in the snow, on one of the highest snow piles, introducing his new spring line of hula hoops. What's not to love about this spirit of dedication and revolutionary love! Every Saturday morning he is out there on his medium stoop selling his hoops and his message of building community through the idea of shared moments of fun ! The Baltimore Messenger caught him in action and capture this great photo of him. Join Spilly on Saturdays in front of the Waverly market or for family free hoop sessions at Studio thirty 4 at 623 W. 34th St. Suite 105 Baltimore, MD 21211, every Sunday from 10:30 AM to noon! Also look for his new spring line of speciality hoops in his new etsy shop here.